Many people really has a deep admiration for their tacos and burritos, if you are one of those then this Blitz Arcade favourite. 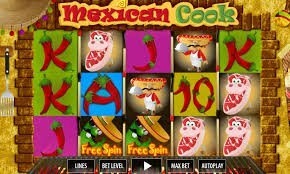 Mexican cook slots employ more than just your typical slot icons. It is fun and can bring that much needed comic relief while trying out your luck on the table. 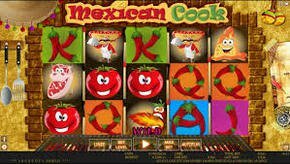 From the makers of world-renowned online entertainment games, World Match, Mexican cook slots is revolving around your favorite Mexican cuisines. It has five reels and 15 pay lines and the symbols are easily recognizable. They are chili peppers, a slice of mouth-watering beef, that piece of cheese, tomatoes and the chef. The chili peppers resemble A, K, Q, J and 10. In order to get a prize, you must collect a minimum of 3 symbols per kind. The wild symbol would be the hilarious chili peppers belching with fire. Like most video slot variations, the wild card allows you to substitute it for other symbols. Another great thing about the Mexican slots is the free symbol, which looks like your typical Mexican icon only it is a cactus. The good stuff would come out from you able to collect three of this free symbol across the matrix and you will have 10 free spins with triple the prize. Meanwhile, the STOP function allows you to stop the spin anytime you want. However, this video slot game may be a little disappointing if you are looking to win something big as the jackpot is not that big compared to other games. Everything on this online game shouts Mexican - the sound effects, the background images such as the sombrero and the symbols. The chili pepper grooving to the sound brings forth hilarity. It also offers tons of special prizes and rewards that you can enjoy while munching on your tacos and nachos right at the comfort of your own home. We also invite you to visit our page for the best Canadian arcade games. We update the list regularly to make sure that only the best games are available.